The Virginia Athletics Foundation's Celebration of Champions event was held in October to honor the foundation's donors and give donors a chance to mingle with student-athletes who were current recipients of foundation scholarships. 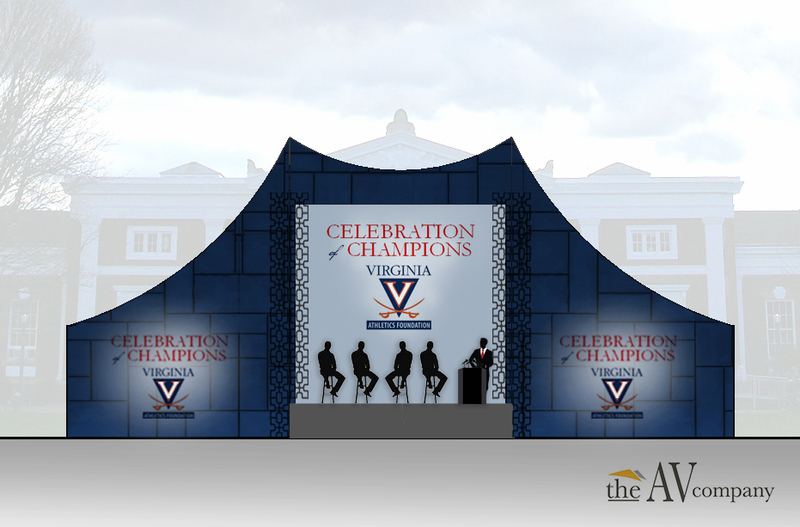 For this event, we were tasked with creating an interior treatment for a tent placed in the southern section of the Lawn at the University of Virginia. We decided to use a spandex divider to give the stage a large, impactful backdrop and came up with some fun school-spirited graphics to project onto it. We further transformed the tent using colorful lighting, our crystal columns, and some fun architectural panels from Atomic Design! Check out the final result below!